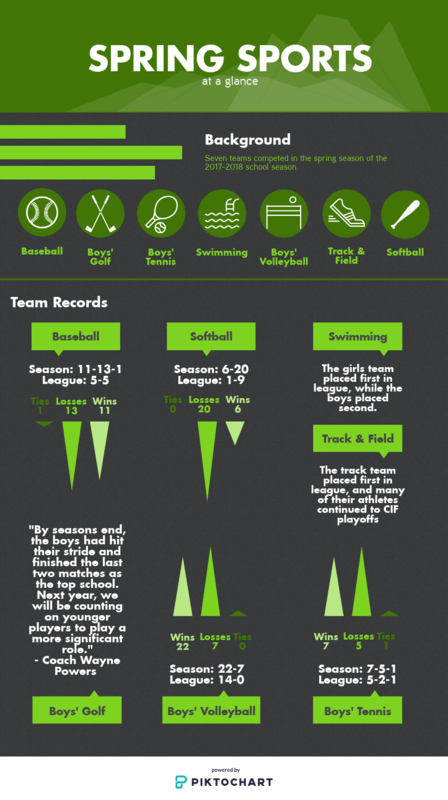 Below is a recap of how every Dragons sports team fared during the 2017-18 season. Finishing the season with an overall record of 14-0 and a league record of 12-0, the girls’ golf team went undefeated for the second season in a row. 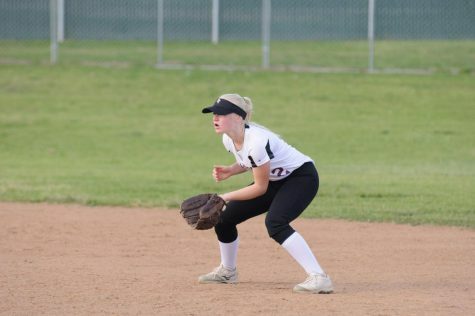 They advanced further in the California Interscholastic Federation (CIF) team divisionals than the previous years, and three Foothill girls were sent to CIF individual finals: Sammie Fenton ‘20, Hannah Hart ‘20 and Anna Pyron ‘19. The team was able to place better in CIF this year, Dunn said, because they started practice earlier in the year. Some of the girls were able to gain confidence and skill from playing in tournaments over the summer. This improved confidence of the team as a whole is what Dunn would say made the difference. With quite the reputation to uphold, the cross country team for the 2017-18 season was no disappointment. In fact, according to coach Ken Reeves, his expectations were exceeded. The Dragons won all four divisions in league, going undefeated for the third straight year. Girls’ JV and Varsity as well as Boys’ Varsity won all seven small schools’ divisions at the Ventura County Championships. In CIF Finals, the girls came in first while the boys came in third. 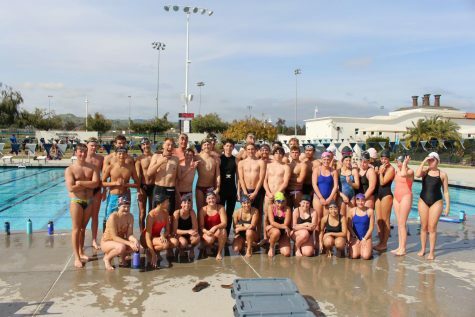 The girls then went on to earn the title of California State Champions, while the boys again placed third. 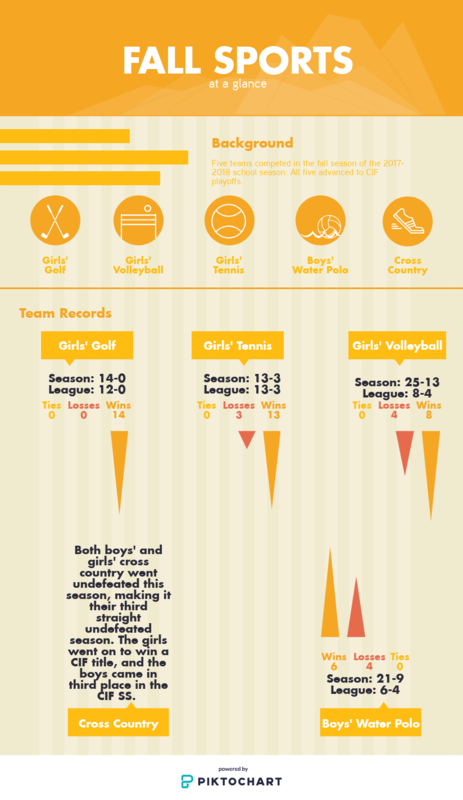 Girls’ volleyball finished 25-13 overall while posting a league record of 8-4. In addition, the team made it to CIF Finals and the semifinal round at the state tournament. Coach Kris Gullatt considered this a “breakthrough for the program.” Gullatt feels that simply making it to the CIF Finals was an “amazing” accomplishment. “We were able to distribute the responsibility and have contribution from all positions,” Gullatt continued. The girls’ tennis team earned second place in their league with a record of 11-3, and the season came to an end after a loss in the second round of the CIF playoffs— the furthest the team has gotten since the program began. Next year there will not only be a batch of new players but a new head coach as well—Head Coach Brad McClain will be retiring after four years of coaching. 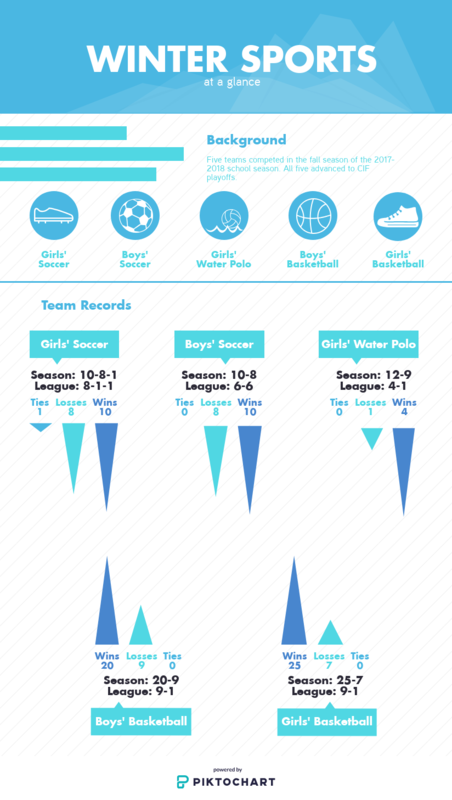 With an overall record of 21-9, this year’s water polo season went much more swimmingly than any previous year. After getting third in the Tri-Valley League with a record of 6-4, the Dragons advanced to CIF for the first time, making it to the quarterfinals. According to coach David Wallace, this was their “best season” yet. He added that “the senior leadership and experience made it possible for us to win close games. For Wallace, the most memorable of these being their overtime win over Pacifica/Garden Grove in the Chino Hills tournament that put them at number one in their division. The 2018 girls’ soccer season went “really well” in comparison to the previous season, according to Alyssa Elias ‘19. 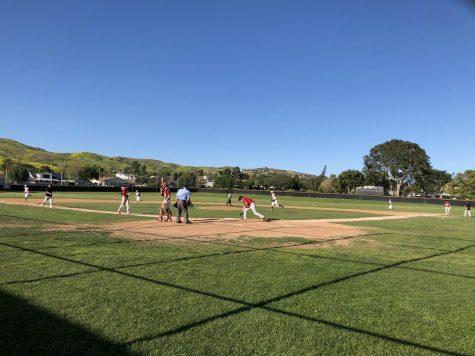 The Dragons went to the second round of the California Interscholastic Federation (CIF) playoffs; in addition, they placed first in league alongside the Santa Paula Cardinals. Their overall record was 10-6-1. Craig also stated that “everyone contributed” to the team’s successes. However, two players who were commemorated by all of the coaches in the league were Elias and varsity goalkeeper Keara Fitzgerald ‘20. Elias received most valuable player (MVP) of the league and Fitzgerald was chosen as Goalkeeper of the Year. The Foothill varsity boys’ soccer squad made it to the CIF semifinals this season. The team’s league record this season was 6-6-0. Although their success was a team effort overall, he also believes that a few players stood out to him in particular. These players were Kyeler Brant ‘20, Cole Chilcutt ‘18, David Hill ‘18, Luke Shadden ‘21, Calvin Turville ‘19 and Max Turville ‘21. Meanwhile, Shadden received All-League second team honors and best defender for Foothill; Chilcutt was chosen for All-League first team and MVP for the Dragons; Calvin Turville was chosen by Wedderien as most improved; and Hill, the team captain, was an “outstanding leader,” according to Wedderien. The girls’ basketball team was met with a lot of success in the 2018 season, as they were able to qualify and make a deep run in both the CIF and state finals. With their overall record sitting at 26-7, they fought all the way to the final round of CIF and later reached the third round of state. Cydnie Gutierrez ‘19 felt that they “really came together and each player played to their highest ability every game” and every player helped to get them where they were. He also stated that they “moved the ball well, had great chemistry, and enjoyed every moment” over the course of the season. Making it to CIF Finals and the second round of the state tournament, the team went “as far as we’ve ever gotten,” according to Bova. Unfortunately, they were vanquished in the CIF Finals by Nogales High School and fell to San Diego High School in state. Orm is excited to show that the team does “really belong” in the higher division. The Dragons’ girls’ varsity water polo team had an overall “fun and amazing season,” as said by Annika Arroyo ‘20. Their overall record was 12-9 and they were able to make it to the CIF playoffs. The team was also able to beat their rivals, Malibu High School, this season. “This season was a lot more team-driven which is how the sport should be played. It wasn’t only one person scoring all the goals” commented Arroyo. Roman most looks forward to “getting to involve the players getting moved up to varsity” and “more experience with help” from soon-to-be second-year Head Coach Ben Gossard “to build up our team” next season. Arroyo is hopeful that they will be able to beat Malibu again and improve “as a team” in general. The team finished with an underwhelming record of 6-20 and went 1-9 in league. The team failed to make the playoffs for the second straight year, which Jamie Dietz ‘19 felt didn’t meet their expectation going into the season. The team lost more than half of their players to graduation, so they will look to get back on track next year with a younger core. The largest sport that Foothill has to offer pulled their weight this season, going undefeated during their regular season and having many athletes qualify and compete in CIF. Nathaniel Russell ‘18 won pole-vaulting for CIF and became Foothill Technology’s first ever individual CIF champion. Others, like Iak Wright ‘19 in long jump, set records for the Dragons. Blythe Blakeman ‘19, a distance runner, made it all the way to the CIF Finals meet. 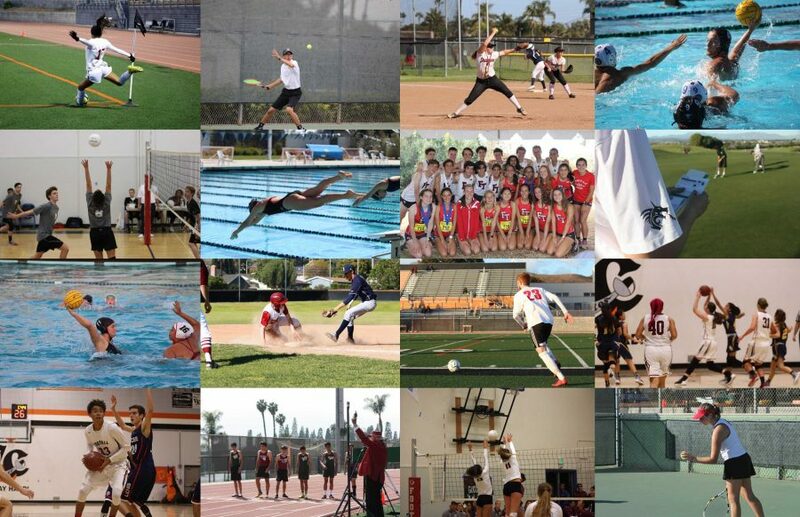 “Our goal next season is to get more people to CIF and maintain our undefeated title. It was a great season,” she said. Under the direction of head coach Jason Dinkler, the Dragons will look to build on what has been a very successful first four years of their program. Foothill’s young team had a solid season behind their number one and two players Yuvraj Narang ‘20 and Ethan Wang ‘20, respectively. The squad finished with a final record of 7-5-1 and 5-2-1 in league play. The team managed to snag a win in the first round of California Interscholastic Federation (CIF) playoffs, but exited shortly after in their second round match. Carpinteria High School beat the Dragons twice in league and finished an undefeated 8-0. 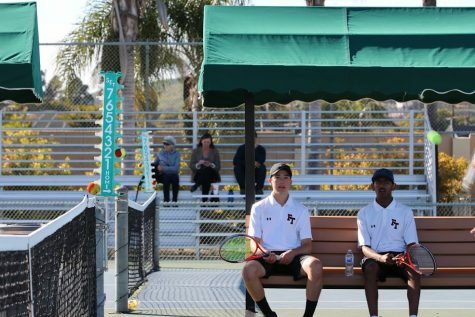 “We need to just work harder, hopefully have longer practices, because if our weaker doubles and singles teams can play better tennis and get those few extra key games in their matches, then we can advance further in CIF,” Narang said. With eight of the 10 players of the varsity team entering their senior season, the boys’ volleyball squad knew that the time to win was now. Not only did they win plenty of games over the course of the 2018 campaign (22-7 overall record), they exceeded expectations while recording arguably the most successful season in program history. Head coach Janine Cobian stated that “our goals for this season [were] to win league and to make it past the first round of CIF.” However, the team soared above and beyond anything Cobian could have ever hoped for. They posted a flawless 14-0 record in league play and claimed the title of Tri-Valley League Champions. 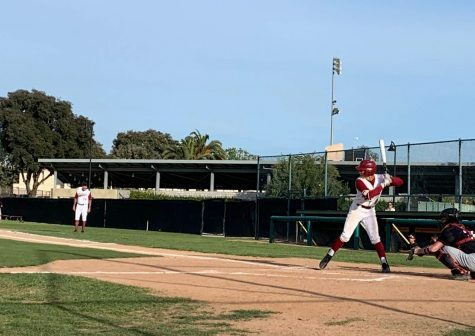 The Dragons then went on to the Division III CIF Southern Section tournament, where they won their first matchup against Morro Bay High School before bowing out in the second round to Downey High School. Cobian pinpoints “beating Bishop [Diego High School] in three sets, both at home and away, and winning the first round of CIF against Morro Bay” as the high points of the team’s season. The only returners from the 2018 varsity team will be Matt Godfrey ‘20 and Miles Harvey ‘19, and they will look to replicate the success achieved in this past year. In the 2018 campaign, “a few key absences left FTHS boys with a single All-League representative, Aidan Donnelly,” Powers continued. 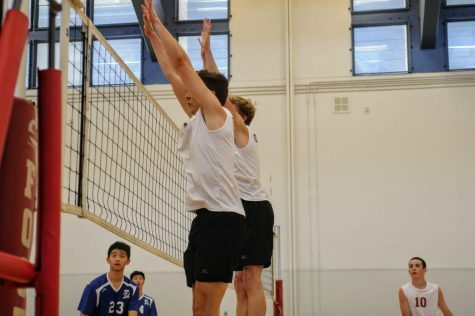 One of the team’s highlights was a one-point win in a crucial match against Saint Bonaventure High School and Malibu High School, among others. The boys’ varsity baseball team significantly regressed from their unprecedented season last spring. In 2017, they posted a near-perfect 9-1 (17-8 overall) league record while claiming the Frontier League title. The following year, the Dragons went 5-5 (11-13-1) in league play, placing third in the Frontier League. They finished behind undefeated league champions Bishop Diego High School and Santa Clara High School, respectively. “We had hoped to have done better than our previous season but we did fall short of that goal,” player Tyler Hong ‘20 said. However, the team still qualified for the Division VI CIF Southern Section tournament, where they lost the wild card game against Pacifica Christian/Santa Monica High School. As a team, the Dragons’ pitching was quite impressive. They posted a cumulative 3.05 earned run average (ERA) while throwing three complete games. All of those complete games came from Troy Lindemann ‘18, who was extremely reliable over the course of the 2018 season. Lindemann went 5-1 with a 2.16 ERA over 58 and one-thirds innings pitched while striking out 53 batters. 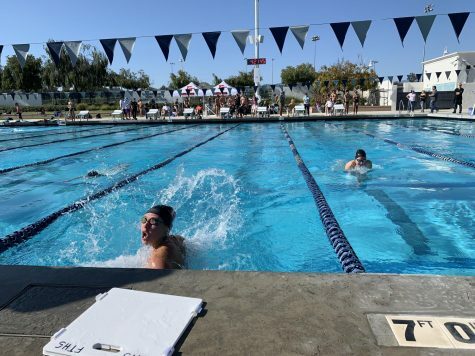 While they did not send any male representatives to the CIF Finals, five girls qualified for the prestigious meet from the Foothill varsity swim team. Annika Arroyo ‘20, Heidi Fedde ‘21, Giovanna Postma ‘21, Caitlin Potter ‘19 and Sydney Roman ‘19 competed in the 2018 California Interscholastic Federation (CIF) finals at Riverside Community College. As a team, Postma, Roman, Potter and Arroyo placed ninth in the 200 Medley Relay and 16th place in the 400 Freestyle Relay. Arroyo also came in sixth place in the 100 Breaststroke and placed seventh in the 200 Individual Medley. Potter earned 13th place for the 100 backstroke and placed 18th in the 200 freestyle. Fedde competed in the diving portion of CIF and placed tenth. 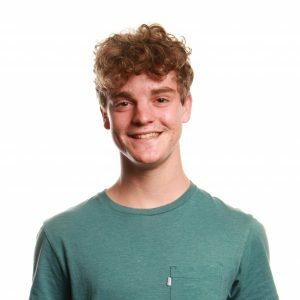 Boys’ varsity swimmer Nic Aguilera ‘19 said that the best moments of the season came when the meets seemed like they were never going to come to a close. He noted that “as a team, we would always sit together and talk for hours” pass time, improving their chemistry in the process.